You can save money by digging the hole for your pool yourself, but you need earth-moving equipment, the exact measurements of your pool in all its dimensions, and a way to get the machinery in and out safely with minimum damage to existing landscaping -- and don't forget about the big pile of earth you have to deal with as you excavate the hole. A detailed plan for each step of the project will help you get the pool you want at a reduced price. Check with your municipality to get required permits. Check to see if any utility lines cross the proposed site of your pool. Determine the location of any decks you want to install and any fencing that you need. Stake out the shape of the pool on your property, adding 6 inches in each direction to the measurements or as specified in the pool supplier's dig diagram. Use a shovel to remove sod and level the ground inside the stakes and to the limits of a poolside deck or patio. Use a small bulldozer or skid loader if the area is large, if it is difficult to dig or if the ground needs a lot of leveling. Draw the outline of your pool with spray paint. Dig a test pit inside the stakes to the maximum depth of the pool. Check for water infiltration and solid rock. If you find water, get a pump to pump out excess water before you start excavating. If you hit solid rock, you may have to change the design or location of your pool. 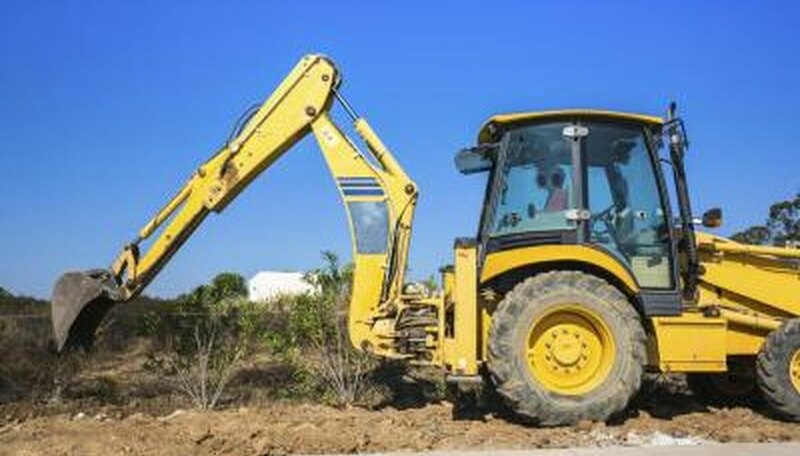 Rent a backhoe or skid loader, depending on the size of the hole and on how much room you have to maneuver your equipment. Arrange for trucks to remove the earth you dig up unless you have a lot of room and plan to use the earth for fill. Make sure the machinery can enter and exit the site on solid ground. Dig down to a depth approximately equal to the deepest part of the pool. Tie a string across two stakes 6 inches above the ground, level it and measure the depth to the bottom of the hole. Check with your pool supplier whether you need to leave room for gravel at the bottom. Dig to the required depth, moving the string and measuring again as necessary. Use the shovel to clean out the corners, smooth the walls and make minor corrections. Make sure you have provided space or extra depth for drains, filters or pumps. Check the main dimensions to make sure the hole matches your design or the pool supplier's dig diagram. If you're not comfortable operating heavy machinery, hire an operator with pool-digging experience to use the rented equipment. If you use a backhoe, keep it well away from the edges of the hole to avoid collapsing the hole's sides. Specialty Pool Products: Digging Your Own Inground Pool - Dig It!